These stories are set between the events of Star Trek: The Wrath of Khan and slightly beyond Star Trek: The Final Frontier. The primary crewmembers from the first and second missions under Kirks command are reunited for a series of adventures which end with a return to Vulcan for the Enterprise and Sulus subsequent departure for the captaincy of the science ship Cooper. Written as a sequel to Star Trek: The Final Frontier, Chris introduces to Spocks bondmate, TLiba, and explains why the name of Sybok has not been spoken in decades. 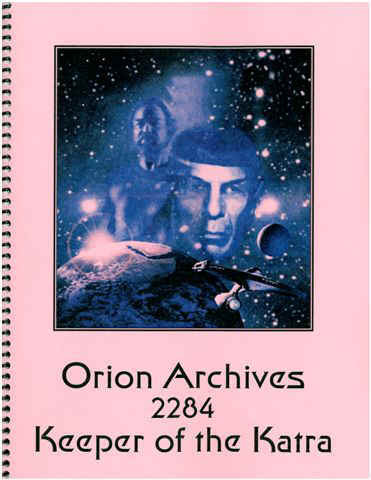 The Vulcan political intrigue, Kirks anger toward Spock, McCoys mediation skills, and Sareks family history are all fully explored so that the readers can actually read this story and make sense of what we see in Star Trek V. Note: Sexual themes. Artwork by Jim Boursaw, David Lawrence and Gennie Summers. 159 pages, 8½" x 11" size, coil binding. Color cover by the Italian Star Trek Club.